The concept of living in the time is about how to transform a living space in a more responsible and sustainable space while keeping it full of dreams and personal touches. One of the most loved idea is the Outdoor as part of the indoor interiors. I don’t want to talk about trend, as I don’t see this outdoor idea going away anytime soon. We are more willing to live with the nature than being surrounded by cement, but the outdoor must have all the amenities, functionality and attention to details as any interior, to feel livable and comfortable. 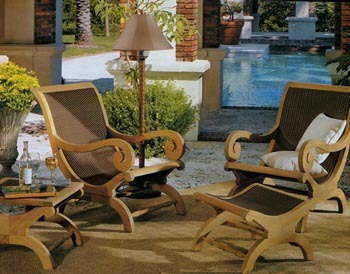 Outdoor furniture should be carefully selected for durability under the weather. Teak Wood is the common name for the tropical hardwood tree species Tectona Grandis native to south and southeast Asia, mainly India, Indonesia, Malaysia and Myanmar. It is used in the manufacture of outdoor furniture, boat decks, cutting boards, indoor flooring, countertops and as a veneer for indoor furnishings. It is weather, termite and pest resistant even when not treated with oil or varnish. One of my friend introduced me to Ifit another hard wood from Guam and Pacific Rim. The extremely dense and reddish wood is highly termite resistant and was once extensively used for interior woodwork such as flooring, window frames, corner posts, cutting boards and other accessories, as it is highly polished. These type of wood species being durable and pest resistant become eco-friendly because they will outlived us and hopefully we will buy them only once, but their traveling will need lot of petrol to take them from their native lands to their next destination. While decorating with sustainability in mind, think of a variety of eco-friendly upholstery fabrics, such as organic cotton grown without pesticides and not genetically modified. Organic Cotton is printable in many patterns and choices are endless. Hemp is stronger and more durable than cotton, needs half as much water to grow and doesn’t require pesticides. Hemp is just beautiful if it remains in its natural coloration, as shown on the chairs in my photo. I was really surprised the first time I saw a Tencel Fabric, made of wood pulp fibers. The moisture and temperature control is the wonderful benefit of clothing made from this unique way of processing a tree. The Tencel fabric pulls the moisture from the skin and releases into the air. Lounging around the poolside, or having a soft bathrobe made of wood pulp fiber is pure pleasure! One other area that contributes to the making of a perfect outdoor living concept are the picture windows. It is very nice to admire the view from the garden, or the beauty of a night skyline of the city while sitting in a bathtub, but we must not think only of our inner pleasure. It is necessary to reduce home heating and cooling costs through air sealing techniques and house insulation. By plugging air leaks with caulking or weather strips, we can save more than 10 percent on the energy bill and by using Energy Star windows we reduce the heating bill by 30-40 percent compared to uncoated, single-pain windows. Weatherized the entire home will provide year round comfort and savings. Cool the house without air conditioning by using fans, specifically fans which remove the hot air from the attic and exchange the hot air in the house with cool air from outside. A whole house fan is a large powerful fan that gets installed in a central part of the home (typically a hallway) and blows from the house into the attic. As the house fan blows, the pressure in the attic increases and the pressure in the house decreases. The hot air in the attic then vents through roof and other attic vents. Of course this is a one time large expense. Ceiling fans are less expensive and do a great job too in cooling the house without air conditioning. Tropical style ceiling fans will make a wonderful addition to any décor, whether it is traditional, rustic, tropical, or even elegant. Ceiling fans with blades up to 60″ or 72″ long are powerful and large enough to be right at home and keep us cool. Valentina Cirasola has been in business as a designer since 1990. She has helped a variegated group of fun people realizing their dreams with homes, offices, interiors and exteriors. She is a designer well-known to bring originality to people’s homes.